The Golden 50th anniversary of the Cuban Revolution was marked on New Year’s Day. Fifty years ago, Fidel Castro and his small group of bearded rebels entered the city of Santiago on the first day of 1959, just hours after General Fulgencio Batista fled the country. A week later, they would ride triumphantly into Havana and change the course of human events forever. Since that time, ten US administrations have gone to extremes in their failed attempts to isolate Cuba and eliminate its top leader. There have been invasion attempts, assassination attempts, terrorist attempts and an inhuman, illegal embargo meant to make people so miserable and unhappy that they would revolt. But it never happened. Cuba, her people and the Revolution have prevailed. Fidel Castro and the Cuban Revolution have inspired many people around the globe, especially in Latin America and Africa. Fidel Castro remains active, writing on international and domestic issues, his recollections of times past, consulting on policy with his brother and meeting with various visiting heads of state. A very humble man, he has lived to see his dream come true and the Great Cuban Revolution has brought forth many sons to carry the torch and to change the face not only of Latin America, but of the world. At a recent summit, the leaders of the Caribbean Community awarded their organization’s top honor to Fidel Castro. The Order of the Caribbean Community (Caricom) was awarded to Fidel Castro, the first person from outside Caricom to receive it. He was honored for his great contributions to the Caribbean area. As always when given awards, Fidel Castro said he was accepting not for himself, but for the entire Cuban people, people who have always been willing to selflessly go anywhere, anytime there was a need. Despite overwhelming obstacles, the Cuban Revolution has been a success. Cuba’s people are well-educated and healthy, the Cuban environment isn't overrun by cars and pollution and the economy functions without commercial advertising or credit cards. Cuban culture thrives in an optimum environment and people possess a strong sense of history. The Revolution has also made significant inroads in the battle against racism and sexism. These accomplishments have earned the Revolution praise from around the globe, among people of many varied cultures and political circumstances. 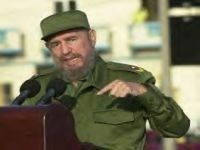 It is noteworthy that Fidel Castro forecasted several years ago in his writings that the bubble of speculative finances in the United States was going to burst and hurt masses of people around the world. His was also a leading voice among those who predicted the damage foreign debt would cause underdeveloped countries back in the 1980s and he warned that the privatization schemes that swept the continent were nothing but a new manifestation of economic colonialism. Unprecedented and amazing have been the small island of Cuba’s contributions to the betterment of this world, sending medical help wherever it is needed and training countless new physicians completely for free. What more glorious testimony can a leader or a country have than to better humanity, giving many, many people chances they never would have gotten otherwise? Nothing can ever diminish the inspiration Fidel Castro has engendered or the good, humanitarian deeds he is responsible for. The Cuban Revolution has been a gleaming beacon of light in a world that has been darkening to the empire’s murderous trampling of international law, human rights and human life. On the nativity of the Cuban Revolution, when Fidel Castro and his small group ousted Batista and capitalist colonialism from Cuba with unshakable determination and courage, who would have imagined that Fidel would be presiding over such a celebration as the Golden 50th Anniversary of the Cuban Revolution.